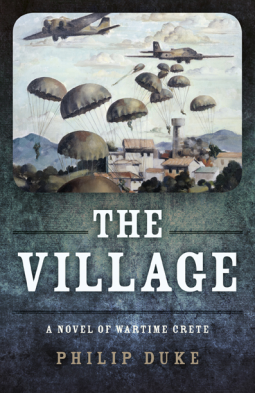 The Village is a fictional account of a very real part of WW2 that we don’t often hear about. Crete is the largest Greek island, located in the Mediterranean Sea with a colorful and often harsh history, having been invaded by Romans, Greeks, Turks, Germans... The Village is the story of the German invasion of Crete in 1941. Anastasia and her husband, son and granddaughter live in the village of Ayios Stefanos, situated above the coastline; Paul Cuthbertson is a British artillery soldier, and Dieter Lehmann is a German paratrooper. All of their lives become entwined in ways that none of them would expect. When the German paratroopers first invade the island they are met with fierce defense from the British, New Zealand, and Cretan forces, but once they take control of the airstrip they effectively are able to take over the island. However, the Cretan Resistance doesn’t back down, and in turn the German forces dole out some horrific punishments on the general population. While The Village is fiction, the author Philip Duke based it on fact, and many of the events in the book are quite real. I was a bit thrown off at first, as the author skips between scenes without much transition (and between characters too a bit further on) but about 30 pages in I suddenly realized I was hooked and couldn’t put the book down! I enjoyed how the author attempted to maintain humanity in all of the main characters, despite the atrocities committed. There are lots of graphic descriptions of battles and massacres, which are not for the faint of heart, but there are also some beautiful descriptions of the island and Cretan people in general. This creates a special balance, where the reader imagines the contrast between the brutality of war, and the timelessness of the island’s beauty. There were a few things that I wasn’t too sure about (the end is a little predictable for example), but all in all this was a great read, especially because the author does not romanticize war in the way that many writers do when creating stories about WW2, and also because the battle of Crete is one we don’t read about very often. It appears that the author has written another novel on the island, and I’m intrigued to read this one now too! Thanks to Netgalley and the publisher for the advance copy in exchange for an honest review. Promised Land is a family saga set during the first two decades of the creation of Israel. Arie and Peter are brothers, separated when they were 14 when Peter’s parents sent him to the US before war broke out and the situation got even worse for Jews in Germany. Arie survived Auschwitz and went to Israel, where he built himself up into a business tycoon. Peter left the US army and joined Mossad. The brothers were united, both holding secret feelings of guilt about how they had survived the war. Tamara and her family are Egyptian Jews who fled Egypt to Israel after WW2, meeting the brothers on the same day in a transit camp they were passing through, sealing their mutual fates for good. I’m a huge fan of both Leon Uris and Herman Wouk. Wouk’s tremendous works on the birth of Israel, The Hope, and The Glory, set the bar super high for me when it comes to historical fiction set in post WW2 Israel, so it is honestly hard to beat that excellence for me. Promised Land is however a compulsively readable novel, and the historical accuracy and use of the author’s knowledge in the storyline is brilliant. Where it didn’t quite make it for me was in the character development and family-related storylines. The whole love triangle part just didn’t quite work for me, and I found a lot of the characters stilted, flat, and stereotypical. For example, women were often described as if they are trophies, and a lot of the descriptions of “delicious” women’s bodies made me cringe. They have jobs and important parts in the storyline, but they are still often relegated to the back, medals that the men earn, and discard as they wish. Having personally lived in Israel and worked among kibbutzniks and families in desert moshavs, the characters just felt too stereotypical for my liking. However, the descriptions of intrigue, spy games, and wars, as well as the background of Israel in general were really good, and kept me reading until the very end. This ended up being a 3.5 for me. The story flows and it’s easy to read, but there are moments within the family storyline that are not so believable. Historically though it is very accurate. Thanks to Netgalley and the publisher for the advance copy! It took me a while to get into this book. It’s written as a first person narrative and nearly feels like a journal of a young British woman living in London during WW2. Which is basically what it is: Emmeline lives in London with her best friend Bunty (every time her name pops up I imagined the copies of Bunty, a comic for girls that I would religiously get every week as a kid). She sees an ad for what she thinks is a real step towards her dream job (war correspondent), but when she gets the job realizes she’s actually just in charge of sorting and typing up problem page letters for the very obnoxious Mrs. Bird. Dear Mrs. Bird is a story of growing up in a world at war, where women’s lives were changing rapidly, more rapidly than society was able to keep up with. It’s also a story of surviving WW2 in London amidst terrible bombing and incessant fear of losing a loved one. I had a hard time with Emmeline’s naivety at first and her constant lack of attention when anyone is talking to her. But as I got further into the book I learnt to love how empathetic she is, how she really just wants to help people, but also how daring and how in charge of her aspirations and dreams she is. It was a slow burner for me, it took me about a third of the book to get into it, and then after that I didn’t want to put it down. I found myself out on a walk with the kids, wondering how Emmy was going to get herself out of another pickle that she had inadvertently got herself into. AJ Pearce does a wonderful job setting the plot in wartime London, including even the little details such as a popular toilet paper brand, and areas that were heavily bombed at a specific time. The style is very much in tune with the style one would find in correspondence, women’s magazines, and literature at the time. I think it was a huge part of why it took me a while to get into the book, but in the end I actually found that I liked it as it helped draw a picture of Emmy and her personality. All in all this is a lovely novel, which will have you laughing out loud at times, and also bursting into spontaneous floods of tears in others (no spoilers here but that does happen too so have your tissues handy). Dear Mrs. Bird will be published on July 3rd, 2018 by Scribner. Thanks to Netgalley and the publisher for the advance copy!